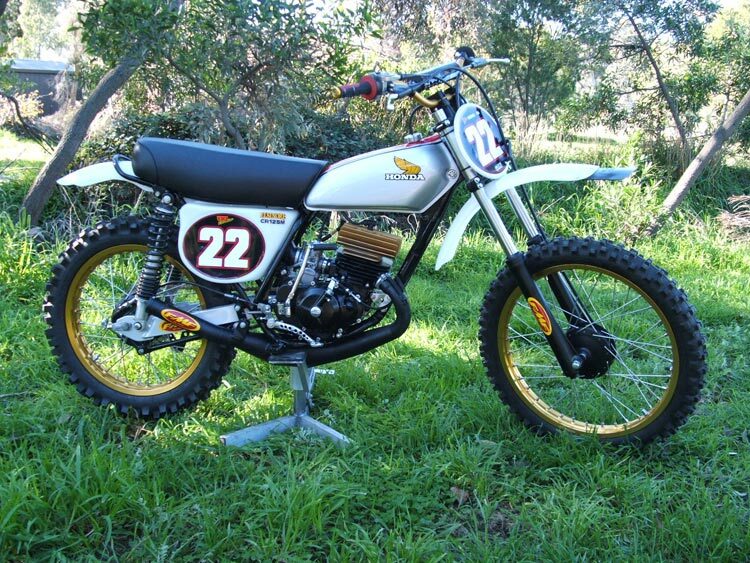 My normal ride is an '81 Husqvarna CR430, but after shedding 17KG a couple of mates suggested I get a 125 to go racing with them now that I am a lightweight. My favorite bike in my youth was a CR125M1, so I decided to build one and I had enough parts to do so. The engine is pretty much standard with a mild port clean up, DG head, FMF pipe &30mm Mikuni with power jet. The chassis is standard with a box section swing arm, new rims & spokes, 14/52 final drive gearing. I went for the opaque plastics for a "works" look and many thanks to Tom from DC plastics who had them made as a special order and to me in less than two weeks. The bike has a broad powerband, if you can say that about a 125, and is not peaky at all. I'm astounded at how fsat I can ride it and many have commented so. After the big Husky, the little Elsinore feels like a BMX bike on steroids, you just twist the throttle & click gears! So far I've won both the pre '75 125 class, pre '75 all powers non expert class, and the evolution/pre '85 125 class against bikes with much more suspension & disc brakes. This has been with the Victorian Classic Management club who run a six round series here in Victoria. It goes as good as it looks, and is a real head turner at the races. I've had many, many offers to buy it, but I love my little Eslinore and she's here to stay!